Alexander Rose Ocean Maldives Corner Sofa:This Alexander Rose Ocean Maldives Corner Sofa has been created with a traditional style and the modern day living pieced together. 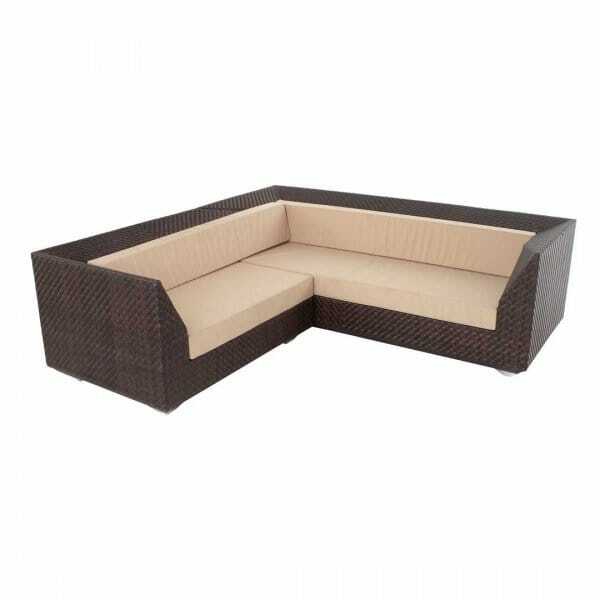 This sofa comes in one piece and can be placed anywhere within your garden and can bring a cit of character in your hosting events. The Alexander Rose Ocean Maldives Corner Sofa has a strong aluminium frame beneath an all weather fibre that has been wrapped around it by hand. This sofa has been made with recycled materials to create a weatherproofed piece of garden furniture and has been treated against UV rays and will continue to look stunning all year round. The cushions are thick and padded for you and your guests comfort and are a lovely calm oatmeal colour, to contrast against the triple bronze coloured fibres. Second Images Shows The Sofa Pieced with The Two Seater Sofa.